carrot | An adventure with food. I don’t know about you but when faced with a bag full of carrots and not much else I struggle to think of anything other than ‘soup’. However a quick browse on the BBC Good Food website unearthed these burgers. They’re a little more faffy than standard chickpea burgers but they stuck together better than any I’ve previously made so I thought I’d share the method. 1 tbsp tahini or hummus or maybe even…smooth peanut butter? If you have a food processor (which I don’t!) add 1/3 of the carrot, the chickpeas, onions, garlic, spices, hummus/tahini/peanut butter and egg and blitz to a paste. If you don’t have a food processor stick them in a large bowl and use a stick blender to blitz. If you don’t have a stick blender then maybe this recipe is not for you…! Add a little oil to a frying pan and fry the remaining 2/3 of the carrot for approx. 10 minutes. Add to the paste in the bowl along with the breadcrumbs and stir together. Get a large plate and cover with a layer of flour. Use your hands to form the carrot mix into patties (eurghk, I hate that word) and place on the flour. Handling gently, flip over and coat the other side in flour. Using the same frying pan, to save on washing up obviously, fry up the burgers for a few minutes on each side, until golden and crispy. Serve with salad, chutney, flatbreads, mayo, whatever! No picture ’cause we too greedy. Sozz. Fruit should not just be reserved for dessert. 3 large pears, cut into – you guessed it- wedges! Chop everything first – vegetables then meat, just to be safe. This is where having a couple of assistants comes in very handy – so if you’re cooking for a group get them to earn their grub! Parboil the carrots, parsnips and potato for about 10 minutes, until they’re slightly tender (basically just make sure you don’t turn them to mush). Preheat the oven to 200oC/400oF/gas mark 6. Get a couple of oven trays or large roasting trays out and put them in an easily accessible place. Mix up all the marinade ingredients (don’t throw away your lemon skins!) in a large bowl. Put a large frying pan on a high heat. Toss the pork in the marinade, give it a good rub around with your hands (just wash them afterwards, a’ight) and add to the frying pan. Seal the outside of the meat, turn the pieces over every now and again to make sure you get every side. You may need to do this in batches – add the sealed meat to one of the trays and repeat. Repeat the process – marinade then frying pan – for the pears and onions, about 5 minutes should do it. Again, depending on the size of your saucepan you may need to do this in batches. Drain your vegetables and add to the remaining marinade with the apricots. Give a good shufty then divide everything up evenly over the roasting trays. Pour over any left over marinade, another glug of oil, a good few twists of pepper, the bay leaves and the lemon skins, give one final shufty and put in the oven for about 20-25 minutes. After 20-25 minutes, take out the trays, give a good shufty, return to the oven and turn up to 220oC/425oF/gas mark 7 for a final 10-15 minutes. Take out and serve – succulent meat, caramelised fruit, roast vegetables all in one incredible ensemble. Sorry, no picture – couldn’t stop myself from getting stuck in! This is ripped almost completely from the pages of Hugh Fearnley-Whittingstall’s River Cottage Every Day, with minor alterations here and there. I thoroughly recommend the book by the way, it’s got such a range of food that tastes awesome and requires very little skill/finesse. Perfect for me then! You could totally add loads of other vegetables to this to beef it out cheaply. Or veg it out I suppose would be a more appropriate term…leeks, turnips, sweet potatoes, squash…et cetera! 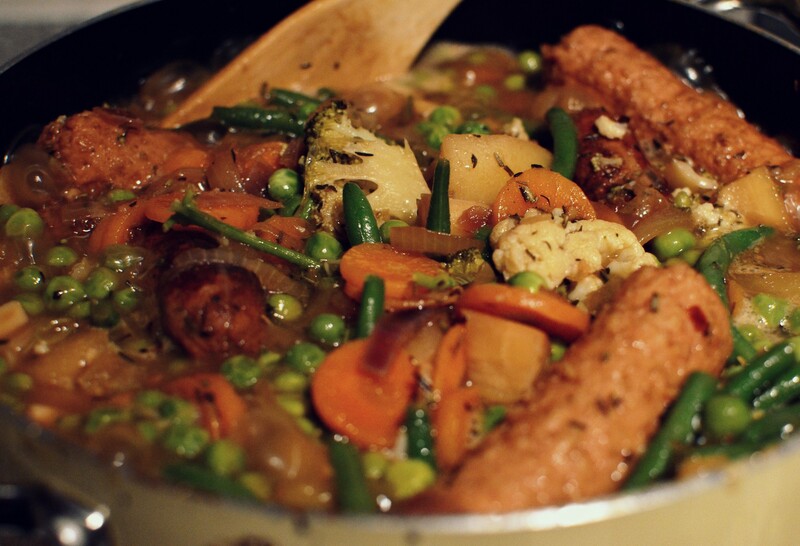 A proper winter-y, root vegetable body-warmer of a dish. Like a hug, from the inside. N’awww. P.S. Sorry for all the chopping! If you’ve got any life left in you after all that chopping, heat some oil and a dollop of syrup in a l-a-r-g-e casserole dish. Brown the sausages (I cut mine in half, half-way through the browning process) on a medium-high heat then remove and set aside. Add the onions to the oil, lower the heat and sweat for 5 minutes, adding some of the cider if the pan starts to dry out. When your onions are nicely translucent, pour in the rest of the cider, add the sausages, potatoes, parsnips, herbs and cumin. Crumble in a stock cube and add a really good helping of worcestershire sauce. Twist in a good few grinds of pepper and salt and pour in enough water just to cover everything. Bring to a simmer, stick on the lid and cook, stirring occasionally for 20 minutes before adding your broccoli/cauliflower. After a further 20 minutes of occasional stirring remove the lid and turn up the heat to medium. I don’t know about you but I prefer my stews thick and saucy rather than wet and runny. To help thicken the sauce, put 4 tsp cornflour (or normal flour if you are cornflour-less like me!) to a suitable receptacle. Add a little of the sauce from the pan and stir together with your spoon to try and remove any cornflour lumps. Add the thick, icky mess to the stew and stir in. You might have to do what I did and ladle out some of the sauce into another pan and reduce it down separately, but if you’re well endowed in the casserole dish domain you probably won’t need to do this. 10 minutes before serving, when everything is well cooked and your sauce is reducing throw in the peas and beans. Taste-test along the way and add salt/pepper/worcestershire sauce/whatever to suit your tastebuds. Serve when everything is beautifully tender and there you have it. Dead easy, dead tasty. Thanks Hugh! Ignore those ever-so-slightly-dodgy looking sticks, they’re vegetarian sausages for my vegetarian housemate. Not a fan, myself…I’m fine with vegetarianism, but vegetables pretending to be meat? Bit odd if you ask me! Let’s face facts, vegetable curry sounds boring – I had to change the title in an attempt to stop people just skipping over this recipe. I hope it worked because it is simply not the case. This curry is bloody scrummy and, I can honestly say as a full-on flesh-loving carnivore, would not be improved by the presence of meat. (Which is great if you’re a student, looking to save a few pennies). Stolen almost ingredient-atim from The Hairy Bikers Ride Again cookbook. There are a lot of ingredients here, but you could easily cut out half/add other vegetables in and please don’t let it put you off. For example, bulking up with potatoes would make it go further on a lower budget and, despite the ingredient list length, this is very easy to do; it’s literally: add ingredients, cook, stir, add ingredients, cook, stir etc. Simple! Heat some oil in a deep pan/casserole dish, add the onions and sweat until translucent (approx. 5 minutes). Add the turmeric, curry leaves, cumin, turmeric, chilli powder and curry powder, cook for a couple more minutes then add the sweet potato, butternut squash, chickpeas, garlic, ginger and whole chillis. Stir continuously, ensuring an even coating of spices throughout. After 5 minutes add the carrot, stock, tinned tomatoes, coconut milk and sugar, give a right old stir, stick the lid on and cook for 10 more minutes, stirring occasionally. Add the cauliflower, lid back on and cook for 7-8 minutes, stirring every now and again, before throwing in the courgettes, then a couple of minutes later the peas. Season to taste with salt and pepper and any other spices you may fancy. 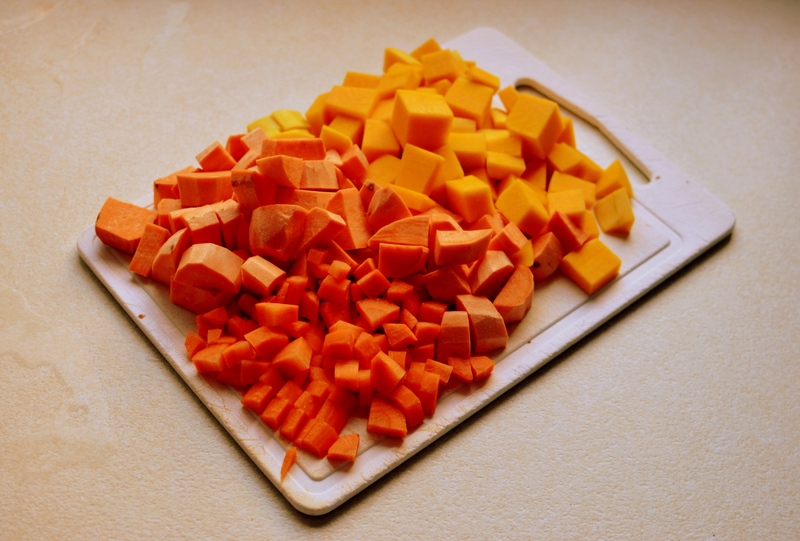 Make sure everything is heated through, your sweet potato, squash and carrot are all tender and your sauce is well-reduced. 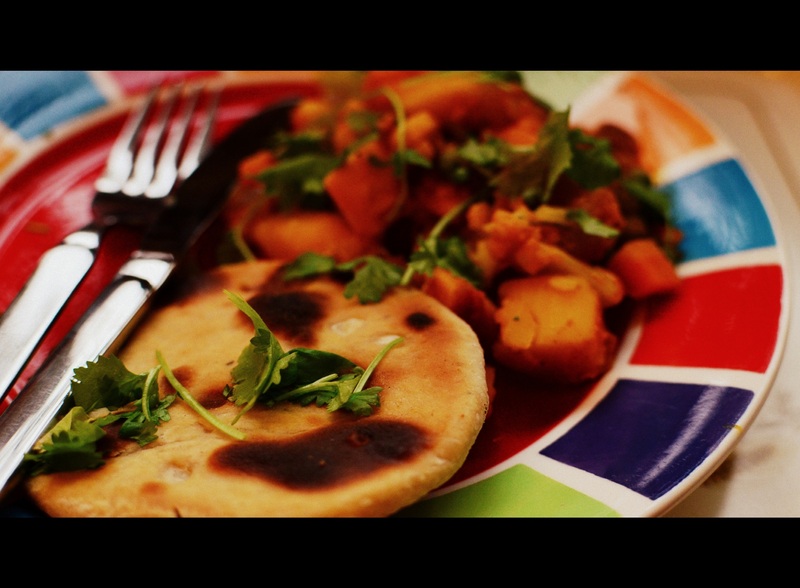 Paratha, as the Hairy Bikers reliably inform me, is a type of Indian flat-bread, usually stuffed with vegetables. I took their recipe and edited it slightly but credit must go mainly to them. I made far too much (which I guess isn’t a bad thing as they’re damn tasty) so I’ve slimmed down my quantities here. This would work with various spice mixes so if you don’t have all the ingredients feel free to mix and match, swap them in and out till your heart’s content! The filling is also perfectly serviceable on its own. I did this over two nights, making the veg mix first then the bread dough the next day. Heat a glug of oil in a frying pan and when ‘ot throw in your onion, garlic and ginger. You’re aiming to sweat the onions rather than caramelise them so don’t have the oil too ‘ot. When starting to soften add the turmeric, chilli powder, ground coriander and cumin and cook for a further few minutes before adding the curry leaves and fresh coriander. When cooked through, turn down to as low as heat as possible to keep warm without cooking any further. Find yourself a large mixing bowl, sieve in the flour, baking powder, sugar and salt. Whisk up the egg, with a pinch salt and dash of pepper and stir into the mix with a wooden spoon. Add the milk slowly – 20ml at a time, until the dough starts to come together. If you add too much the dough will become too sticky and hard to work with. If this happens, as it did with me, add flour a little bit at a time until the dough is less ‘wet’. Add all the spices then work roughly (either with a spoon, or better, with your hands) for 10 minutes. Cover bowl with clingfilm and leave to rest for 15 minutes. Meanwhile fetch your spice-tastic mash. I heated mine on a low power in a microwave for several minutes, until it was warm all the way through. When the dough has rested, flour a work surface and pull golfball-sized clumps off the doughball. Pat down onto the flour, then flip over and do the same. Roll out with a rolling pin to pound coin thickness – it should make a 10cm (ish) round. Add a couple of spoonfuls of mash to the centre (leave a wide margin around the edge) top with some raw spring onion rings then bring the edges of the pastry up and roughly twist over the top to seal (sort of) the paratha. Flip over and gently roll out again, until about 1cm thick. I recommend making a few (2-3 per person) before cooking.